Discover Tuscany beyond the stereotypes and delve into the life of the American photographer Christopher H. Warren who moved to the almost abandoned town of Sorano in 1988 and recorded the stories of the town’s inhabitants. 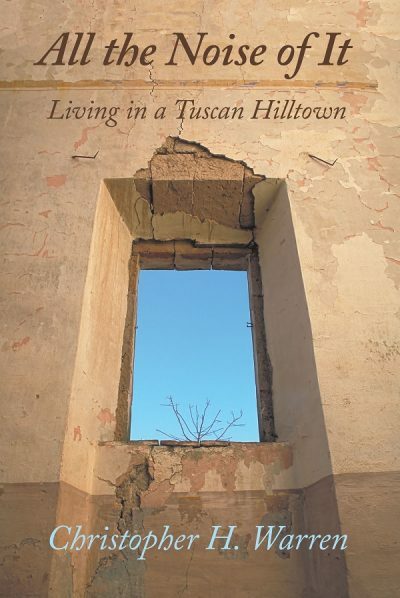 Read an excerpt from Christopher’s book, “All the Noise of It: Living in a Tuscan Hilltown”. >>> Our interview with Christopher H. Warren is here. One summer I exhibited a room of my home. For ten days in August a few artisans and many merchants set up their wares along a route that passes through the old town. Incongruously, most of the objects came from or seemed to be inspired by far-flung places like Central America, Thailand, and India. On occasional evenings musicians invited by the organizers sang pop songs in English. At the time, I was completing decorative touches on what is now the living room. Using hand-colored lime, I painted the walls a light pastel yellow, and the fifteenth-century wooden ceiling a light blue. Two thin dark lines mark the change from yellow to blue at the top of the walls, with a broad dark border at the base. Around the perimeter of the room I mounted photographs showing the ruins of homes from the side of town that was condemned and abandoned in the 1950s. Although dilapidated, the interiors showed how houses were traditionally decorated, and the photographs revealed the inspiration for my painted room. In the early summer, as I was applying one of the ten coats of lime to walls and ceiling, townspeople would stop in to ask why I was not exposing the wooden ceiling and simply whitewashing the walls—a contemporary trend popularized by city “sophisticates” who had been buying up available habitations to use as weekend retreats. It became apparent that the townspeople, some of whom could well remember their old homes, equated the colorful, decorated interiors with what many of them viewed as their provincial and primitive past. During the exhibition, I continued to paint the room and was eager to learn people’s impressions of the photographs and the room. I set up a table with glasses and a five-liter bottle of the wine I make in my cantina according to traditional methods. The surprisingly good “American” wine proved to be a successful draw, and the range of thoughts was both amusing and gratifying. One offended sophisticate from Bologna claimed that my painted ceiling was a travesty and, despite my photographic evidence, insisted that I remove the paint and expose the wood. A haughty professoressa from Florence congratulated me on my “post-modern” interior design. I was more interested in what the townspeople thought, and most were very complimentary about the room. This was surprising to me, as these new sentiments were in such contrast to almost everyone’s initial reservations about the work of period restoration I had proposed. Two elderly men testily asked me why I had gone to all the trouble, but after a glass of wine and a brief discussion, I overheard one remark to the other that being in the room made him feel young again. The previous owner of my apartment, Ernesto Capelli, quickly recognized the only person pictured in the exhibition. Some time before, I was wandering the empty rubble-strewn streets and noticed that a top floor in one of the abandoned buildings had partially collapsed, revealing a room with what appeared to be a small picture frame and clothes hanging on a peg. I got a painting ladder from my home and balanced it on four blocks of tufo to get up to the bare beams of the second floor, where the boards and tiles had fallen through and been removed. Even more precariously, I then carried up other blocks of tufo, placed them on a beam, and put the ladder on top so that I could pull myself up into the room. As I did so, the ladder slipped and clattered all the way down to the ground floor. The room seemed perfectly preserved from another time, and I immediately decided to reproduce the pale cyan color of the walls in my own home. There was a single bed, a wooden table and chairs, a small corner closet with some personal items, and a few dresses and shawls on hooks. The brass picture frame contained a photo of an elderly woman. I photographed the room, stepping gingerly as the floor was decidedly unsound and a large crack in the wall indicated that the building was soon to follow others that had fallen into the river valley. I then had to figure out a way to get myself back down. No one would have heard my voice if I were to call for help, so I fashioned a hook out of a hanger, tied the old owner’s dresses and shawls together and was able to pull the ladder up, after many tries, from forty feet below. I told the story at one of the bars later in the day, including the detail that I had been tempted to take the lovely frame and picture but had decided to leave it out of respect—and some remorse for having ruined the elderly lady’s garments. One week later I walked by the building again and noticed that the frame was gone. Nevertheless, I had the photo, and it was one of the pictures I included in the exhibition. Ernesto said that the woman was his Aunt Teresa Capelli—sister to his father. I learned later in the town hall that Teresa was born on the March 14, 1888, and died on January 21, 1944. Teresa was a spinster and had no children. Ernesto confirmed that I likely was the first person to go into her room since her death forty-five years before. As I had hoped, several elderly people were moved to stop by during the exhibition and recall how their lives had changed since they had left the old town. Others were able to identify homes and owners from the photographs of the abandoned shells. I have spent a considerable amount of time wandering the streets of the far side of town and could only imagine the vibrant life that would have animated those streets only fifty years ago. On another occasion, I was surprised when a short old woman with white hair and in her black widow’s dress appeared at my side. To get to where we were, she must have climbed over a fence and picked her way, somewhat perilously, along a path strewn with broken tiles and blocks of tufo. That had been her home, she explained, pointing up at an open stairway filled with rubble. The black hole in front of us was one of Sorano’s four old bakeries. Every week, she went on, her mother would make the dough, stamp it to identify it as their own, and take it to the oven to have it baked, as did the other families. We chatted a little longer, about the relatively poor quality of the bread made by the one baker in town nowadays, and briefly remarked about the lost skills with which every family supported itself in the past, and we went our separate ways. As I walked away, marveling at how the woman had briefly brought to life the little corner where we were standing, I happily realized how I could get beyond my superficial understanding of the town in which I live. The quotidian detail about the bakery was already greatly illuminating to me. By relying upon the memories of the old people who had lived in the town, rather than my own romantic imaginings, I could make the town live again, if only in my mind. I set about interviewing many of the old people I had made contact with in my years in Sorano. I had heard occasional stories and brief histories and legends while I helped Ivana pick her olives, had my morning coffee with Michele, ate lunch with Annetta, or drank wine with Leopoldo in his wine cave, but I now went to them with my tape recorder and asked them to tell me their personal stories and remembrances in detail. Almost everyone obliged me, although some were suspicious of the motivation of the strangely curious American. One would answer volubly, excitedly and tangentially recalling the great history of Sorano, while another would be brief, reluctant to speak about bitter events and the sad “primitive” past. Their collected memories form a broad and eloquent portrait of life in the ancient hilltown. I questioned Luigino, Matilde, and Gino, who had all lived at some time on the short lane where most of my property lies. Peppina and Augusto were born in town, had moved to big cities, but had returned to Sorano and acutely remembered life there before the war. Maria left Sorano in the 1930s, immigrating to the United States. I found her in an apartment on Webster Avenue in the Bronx. Despite my keen desire to speak again with the old woman in her widow’s dress, whom I had encountered alone on the abandoned far side of town, I was never able to find her. None of my old friends knew who she was. I think of her now as my guiding apparition. 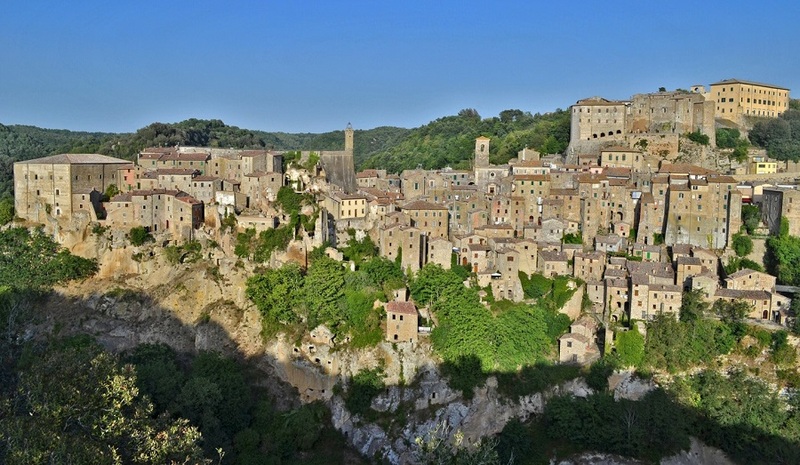 Read more about Sorano on Christopher’s website or find the book on Amazon:. 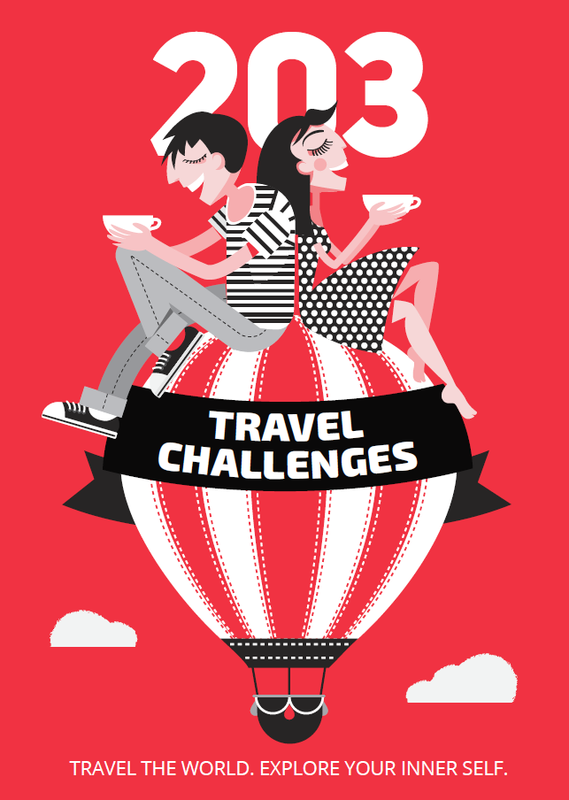 Read more travel book excerpts to find your next favorite author!